Timberwise has been treating Dry Rot for over 5 decades and in that time have built a wealth of technical knowledge on Dry Rot. To help understand Dry Rot better we have now produced our definitive guide to Dry Rot to explain in depth Dry Rot, how it spreads and how we at Timberwise treat it. 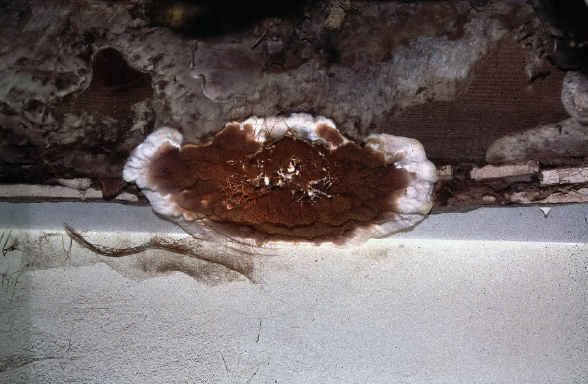 Dry rot is the common name given to the wood destroying fungus, Serpula lacrymans. However, despite its common name it will generally only attack damp timber. Initiation of attack is by either a minute dry rot spore or cross contamination from already infected material, eg, wood, masonry. For an infection to be initiated there needs to be a spore (or some growth that is viable already present), oxygen, a suitable temperature, a susceptible food source and water, all of which are to be found in buildings. Oxygen and a suitable temperature are almost inevitably present in the internal environment. In a normal ‘dry’ environment water will be present in timber but at a level that is not conducive the germination or growth of dry rot, ie, less than 20% (Moisture contents of between 8 – 16% may be found in a ‘normal’ dry domestic dwelling). Even when suitably damp, the natural resistance to decay of some timbers (and properly preserved timber) may prevent rot. Thus, dry rot is not inevitable if wood becomes and remains damp but timbers will certainly be at risk. Omnipresent in the environment, spores will therefore be present in all properties. 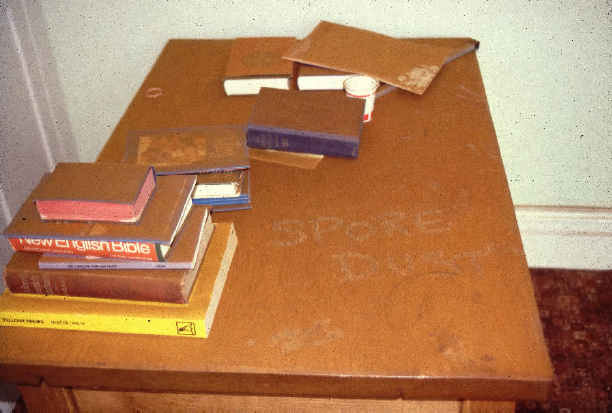 However, a spore will only germinate and infect when there is both dampness and a food source (ie, suitably susceptible wood or some other suitable cellulose based material). For spore germination to be successful it appears that free moisture must be present within the wood above the fibre saturation point, ie, moisture contents in excess of 30%. Thus, for the decay to become initiated the wood must usually be physically wet. This usually occurs as the result of severe water ingress in the form of rainwater leaks, plumbing defects, floods, long term severe condensation, etc. Further prerequisites for initiation of decay are still and humid conditions. The initiation of dry rot appears less likely as the result of ‘capillary bound’ moisture such as that arising from rising dampness although once initiated such dampness will support growth. It is recorded in laboratory culture experiments that spores can germinate between 7-10 days following suitable wetting; this may take longer if the spores are older. However, it appears that in practice under field conditions it often takes some considerable time before rot becomes noticeable. Once initiated a minimum timber moisture content of around 20% is required for the infection to survive although the optimum moisture content for active growth is reported around 35 – 50%; however, the rate of decay at 20% and just above is likely to be very minimal. Timbers within a building are usually kept well below 20% moisture content and are therefore not vulnerable to fungal decay. However, should timbers become damp, then, given the requirements described above, dry rot has the potential to establish and develop. Dry rot will also require a suitable temperature. The optimum temperature for growth is recorded around 22ºC and the maximum temperature around 26ºC; indeed 15 minutes at 40ºC has been shown to kill the fungus. The minimum temperature is around 3ºC. It should be noted that very slight variations on the above figures have been reported. Once established it has the ability to spread over and through damp materials such as damp masonry, etc, and can spread to and attack timbers which are in direct contact with or in very close proximity to damp masonry under still, humid conditions, eg, joist ends, lintels, panelling, fixing grounds, skirtings, or any other timbers which can become and remain damp/wet. Established dry rot normally infests those timbers that remain damp although it can cause wetting of ‘dry’ timber as the result of water produced from the breakdown of the wood in the process of decay. However, this appears only to occur in areas where ventilation is very limited and the humidity remains very high, probably greater than 90% relative humidity. Indeed at these humidities the moisture content of wood will rise in excess of 20% and so could be vulnerable to the support of dry rot. 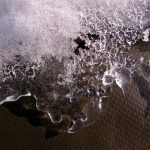 It also has some limited ability to wet up dry wood, but again, this will only occur where there are very humid stagnant conditions or where it may be trapped between impervious materials where water cannot evaporate. Dry rot may spread over onto other materials such as carpets and fabrics if in contact with dampness. However, unless these materials are cellulose based it is unlikely to cause any damage although some discolouration may occur. So, in practice decay by dry rot tends to be restricted to damp, unventilated areas and often remains unnoticed until damage is at an advanced state; frequently it can go undetected for many years. This also occurs where large dimensioned timbers are in direct contact with damp masonry but remain well ventilated in which case the decay only develops within the interior of the member, the outer surface remaining sound. 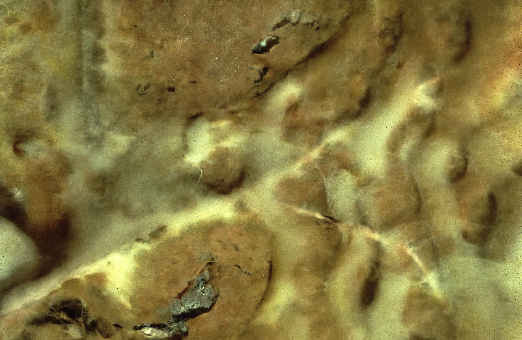 Under very humid, stagnant conditions white cotton wool-like aerial mycelium is produced. In extremely humid conditions droplets of water form on the growth. In less humid conditions the growth tends to form a silky-grey skin, often tinged with patches of lilac and yellow colouration. Sometimes the growth is more of a ‘mushroom’ colour or even sheets of a reddish growth. 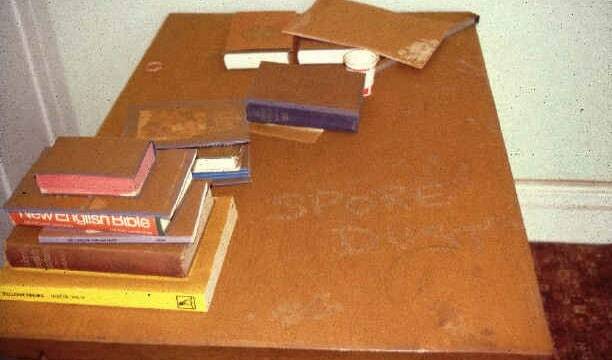 The first sign of the existence of dry rot is often the sudden appearance of a fruiting body (sporophore), or the shrinking/distortion of timbers. This latter feature can be quite dramatic and sudden, the change from dimensional stability to instability of the wood visually taking place relatively suddenly; this explains the apparent sudden appearance of dry rot frequently reported. It should be noted, however, that fruiting bodies are not always formed. Unlike many other wood destroying fungi dry rot can readily grow over and through porous masonry provided that there is a nutritional source (wood) from which it can spread; this ability allows the spread of the fungus from one area to another. 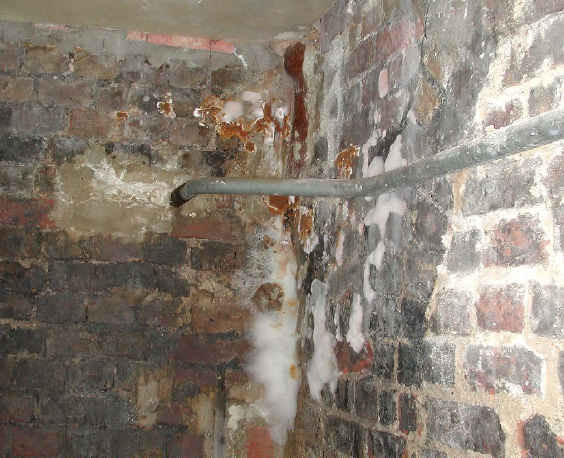 This generally only occurs to any significant level where the masonry is damp either via severe sources of water ingress or rising damp, etc.. Dry rot will not spread over or through masonry that is ‘dry’, ie, that does not contain free (capillary) moisture. A further feature of the fungus is the formation of ‘strands’, thick walled structures which develop in the fungal growth. These are resistant to desiccation and carry nutrients from the food source to the growing tips of the fungus when the organism is growing through or over nutritionally inert materials, eg, masonry, soil. They support the spread of the growth. However, without a source of food growth is terminated. When the decay is advanced the shrinkage causes the wood to split in a cuboidal manner (this is typical of a number of wood destroying fungi), and it is therefore not always easy to distinguish between dry rot and other fungi (wet rot — brown rots) in the absence of fungal growth. Click the following link for more information on what is wet rot. Should infected timbers dry out or the food source be removed the growth will cease but, depending on conditions, it can take considerably longer for the fungus to die. For example, in timbers that have dried down to below 20% moisture content the fungus can remain dormant for up to about a year at ambient temperatures before dying. However, this period may be prolonged at lower temperatures. If infected wood is removed then the growth is very limited and quickly terminated, but the growth can remain viable in damp masonry at low temperature (eg, 7oC) for up to 9 years, and up to 1 year at ambient temperatures. Should new, untreated or inadequately treated wood be put back into direct contact with damp infected masonry, even though the original decayed wood had been removed, then fungal growth may start and spread into the new wood so initiating further decay. 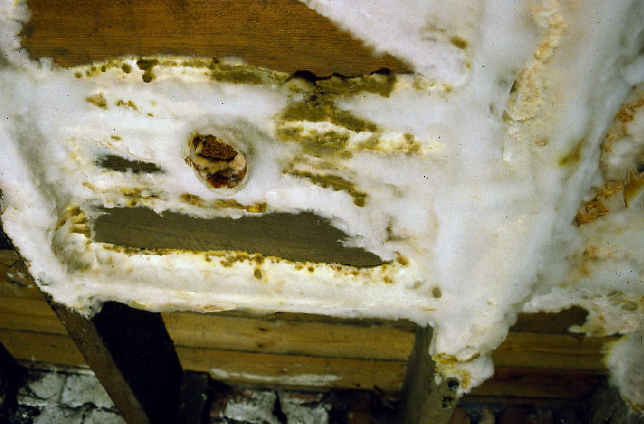 It is not practical to precisely define the rate of growth of dry rot due to variation in the nutritional quality of the food source, dampness, the environment, etc., but in buildings that have been studied growth rates of between 0.04m and 0.8m per year have been recorded (Building Research Establishment Digest 299); C.R.Coggins (1980) gives a slightly higher general figure of about 1 metre per year. Savory (1971) reports figures in an experimental house of between around 1m – 1.45m. The author has reliable figures giving a growth rate of around 1.5 metres per year. In the laboratory, however, growth rates of about 2.9m to 4m per year have been recorded. A further difficulty arises in establishing growth rates in that it is not always possible to tell if the decay is the result of a single outbreak or the coalescing of several individual outbreaks. However, the use of published rates of growth may be useful to help identify if an outbreak could have possibly grown a specific distance in a given time period. In most cases the optimum conditions for growth and decay of timber have been derived under carefully controlled laboratory conditions. In practice, however, it is highly unlikely that such optimum conditions would be present, or at least for any length of time. Thus, for growth and decay the use of ‘optimum data’ within a field situation to evaluate the growth or decay activity by dry rot is unlikely to prove valid. 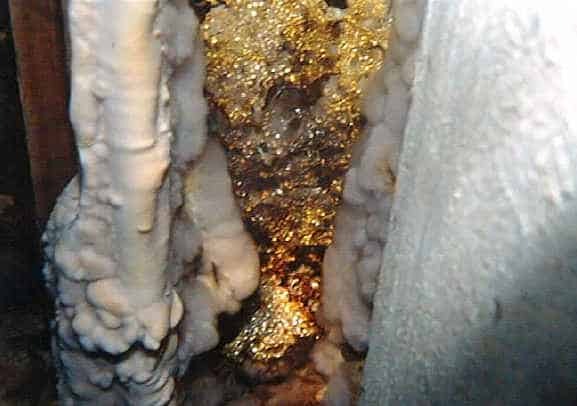 Furthermore, it is possible for dry rot to remain ‘dormant’ under unsuitable conditions for a while, only to become ‘active’ when such conditions become more favourable. 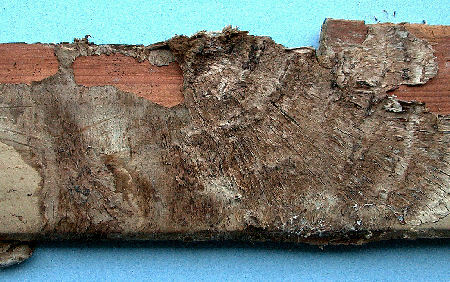 The procedures for the control and eradication of a dry rot infection are given in Building Research Establishment Digest 299 and British Wood Preserving Association Code of Practice for Remedial Treatment; where remedial works are envisaged then the work should be undertaken in strict accordance with the principals and instructions given within the above publications. Basically, the control of all rots is a matter of good building practice but it also requires a thorough understanding of the nature of this particular organism. At Timberwise, we first undertake the fundamental procedure to control and eliminate the rot and that is to eliminate the source of water, to remove infected timber if the rot is active, and propagate and maintain drying conditions. Without either food or water the fungus cannot grow and will eventually die. However, where decay is limited and wood/masonry is now dry, or will rapidly dry once the source of water has been eliminated, then we may leave such timbers in situ if deemed appropriate and structurally sound thereby minimising the amount of repairs necessary and maintaining the structure of the original building; this is particularly important in the case of historic and listed properties. es otherwise it will be of little value. 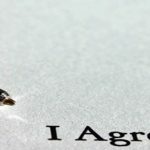 It is these factors which Timberwise fully appreciate. Finally, Timberwise fully appreciates it is imperative that all areas of dampness are identified as timbers within these areas will be at risk to rot developing if such timbers are not fully protected from either the moisture or the rot itself. We are also aware that where dampness is identified and where there may be hidden timbers these may have already rotted. However, previously decayed wood where rot is now dead, may sometimes be found in areas that have dried out and if structurally sound or of no importance these may be left provided they can be maintained dry. Having trouble with dry rot in your property? Call Timberwise on 0800 288 8660 or contact us online to get specialist advice from one of our experienced surveyors. If you want information from your local area then visit Local Timberwise page. How fast can OSB roof sheathing rot out when there is excessive moisture and no ventilation?